This is an honest review based on my experience. I won't sugar-coat anything. I'll share what I love about Coach and what I think needs improvement. This is a two-part review. In this part, I outline the highlights of Coach and why I think it's worth a look. Disclaimer: I've recently become an affiliate for Coach because I believe in the platform. If you'd like to sign up with my link, click here. Coach is the new kid on the block. It started as an online teaching platform for tutors. Then last year they pivoted to serve any entrepreneur who wants to create and sell products online. I’ll be honest: I’ve used a lot of online course platforms, so when the team at Coach contacted me I wasn’t expecting anything new. Then I met with Spencer Fry, the founder. During the interview, he was honest about what Coach was and what it wasn’t. He didn’t hide the fact that they were still figuring a few things out and that certain features weren’t available yet. I told him I'd have a look under the hood first. Here's what I found. The drag and drop builder works flawlessly. Adding sections for your lesson organization is simple. Media uploads and displays without a glitch. You can also add text beneath the uploaded files (great for instructions or contextual information). You can track student progress. Gorgeous design. No, really. Check out the images below. This is what the course builder looks like. This is what your course looks like for students with Coach. From Day One I’ve been floored by the outstanding customer support at Coach. Floored. Responses within minutes. Open invitations for feedback. With Coach there’s zero shadiness or pushy marketing. They genuinely care about helping you grow your business. This has become my favorite feature in Coach. You can use their email newsletter system to send one-off newsletters or drip campaigns. For course creators, that means setting up on-boarding emails is a breeze! Set the trigger (i.e. purchasing your course), type up your email, set the delivery sequence and that's it. Coach will take it from there. Plus it tracks sends, opens and clicks. Everything I’ve mentioned so far is great, but it didn't convince me to sign up with Coach. What convinced me was seeing new features rolled out every 30 days. This team moves fast, my friends. Every.single.time I emailed Spencer about a feature I wanted he said it was already on the roadmap or he added it to their feature request list. This is promising. 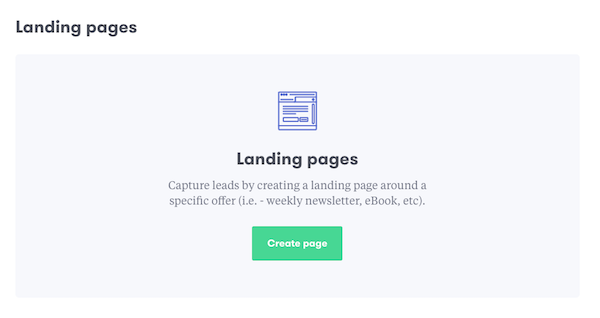 Coach gives you built-in landing pages. You can use these for courses, downloadable products, newsletters--you name it. Landing pages are essential when it comes to marketing online courses. And you need analytics to tell you how your landing pages are performing. Coach gives you both. While there’s still room for improvement with the landing pages--more on that in Part 2--the existence of these features shows that Coach is building an ecosystem for entrepreneurs, not just a course platform. One that has the potential to simplify your systems and put your income on autopilot. Speaking of systems...that’s when the areas for improvement pop up. If you're curious about Coach, click here to sign up. In Part 2, I'll share the areas for improvement in Coach so that you have a full picture. Plus, I'll share my updated LMS chart so you can see how Coach stacks up against other platforms. Click here to read Part 2 of my review. Newer PostHow Much Money Do You Need to Create Your Online Course? Older Post2016 Annual Review: a Year of Learning!